There are several non–mutually exclusive hypotheses for why bears selected minivans. First, it is possible that minivans were more likely to emit food odors regardless of whether they contained meaningful amounts of food available. This argument is based on the fact that minivans are designed for families with children and small children in particular are notorious for spilling food and drink while riding in vehicles. 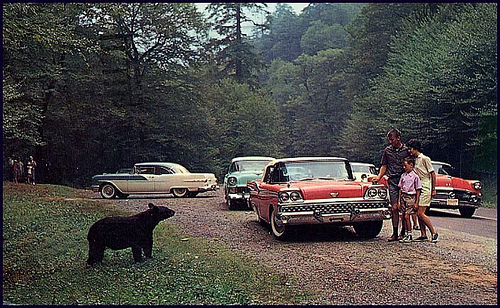 Thus, vehicles transporting children would emit greater food odors, making them attractive to bears. If this hypothesis is correct then any vehicle transporting small children, regardless of class type, should be targeted by bears. To test this supposition, park personnel collecting information on vehicles broken into should also note whether car seats were present, or whether small children are regularly transported in the vehicle, or both. From a fascinating study looking at which vehicles seemed to occasion the most ursine break-ins in Yosemite National Park (“SELECTIVE FORAGING FOR ANTHROPOGENIC RESOURCES BY BLACK BEARS: MINIVANS IN YOSEMITE NATIONAL PARK,” by STEWART W. BRECK, NATHAN LANCE, AND VICTORIA SEHER); perhaps inevitably, in terms of animal/vehicle adaptation, it reminded me of the observations of crows using pedestrian signal crossings to retrieve the nuts they had dropped into the street (where they could be “opened” by passing cars). Note to thieves: Another reason bears favored minivans is that they’re easier to break into. This entry was posted on Tuesday, October 27th, 2009 at 6:38 am	and is filed under Traffic Culture. You can follow any responses to this entry through the RSS 2.0 feed. Both comments and pings are currently closed.